Silver Cascade Falls is a wonderful place for a quick, get-away romp over some moderate grade ice that is oh-so close to Colorado Springs. Merely drive to the top of Cheyenne Canyon and park at the Helen Hunt Falls trailhead. From there, it is only a few minutes walk to the base of the falls. Sporting moderately steep, this is a wonderful place to take someone to learn the basics of ice climbing or to get in a quick lap or two when you cant get away from town. From the parking lot at the trailhead, follow the trail for two switchbacks until you arrive at an obvious shoulder. This is also where the wooden fence pinches down into a very distinct corner. Hop the fence and follow an obvious trail down into the creek bed. There is also another way to approach the stream bed from below without having to climb over the fence, but I have never been that way. Once you are in the stream bed, follow it to the base of the climbing. You will know it when you get there. Here you will find some very nice logs that make a wonderful bench where you can sort gear and put on crampons, etc. 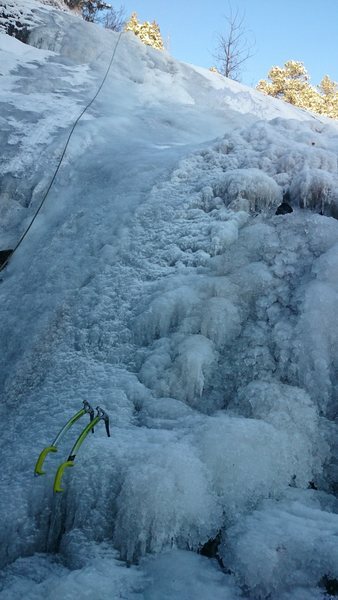 The ice follows two rolling bulges to reach the top of the overlook in about 165 feet of climbing or so. Actually, the technical stuff is over much sooner, and you will be walking over snow for the last little bit. There are some trees at the top of the bulges where a top rope can be set up. To get down, either rappel, scramble down to the climbers left, or walk down the trail from the overlook. Enjoy. For gear; screws, quick draws, and some slings will be all that is necessary. Marie finishing her lead, 1/23/14. Marie leading the main wall. Melissa TRing Silver Cascade, 2013. Finishing the short crux start to the upper slab. Silver Cascade Falls from a little to the side. Silver Cascade Falls from below. I found a piece of gear hanging from a tree at the base today. If you can identify it, I'll gladly return it asap. WI2 is a stretch..... WI3 is fantasy. Two moves of poss WI2 at the top at best. A fun place for laps, beginners, etc. Rope soloed here on 11/14/14. The ice was quite good, but my guess is that it has melted out after our most recent cold spell. I would describe it as "WI2 punctuated with short WI3 sections", depending on your line.